They always say the second time you visit a place is never as good as the first time, but the experience of my second visit to the Canary Islands while recording sound resources on proposed routes through Tenerife, La Gomera and El Hierro was very rewarding. And this because of a main reason: I could remove the thorn stuck for not being able to record the sounds of two very identifying elements on the first visit in April. The first identifying sound is one from La Gomera and the second, I would say, one of the Canary Islands in general. Examples of emblematic resources of a proposed ecotourism in the Canary Islands. So, after being captured, edited and cataloged in the project, I do not want to miss the opportunity to share it in our blog. The first recording corresponds to one of those magical moments that I experience during the development of this project. Josué is one of those faces with names and surnames that with their effort, dedication and passion are especially committed to maintaining traditions and resource of high ethnographic value and keeping them more alive than ever. 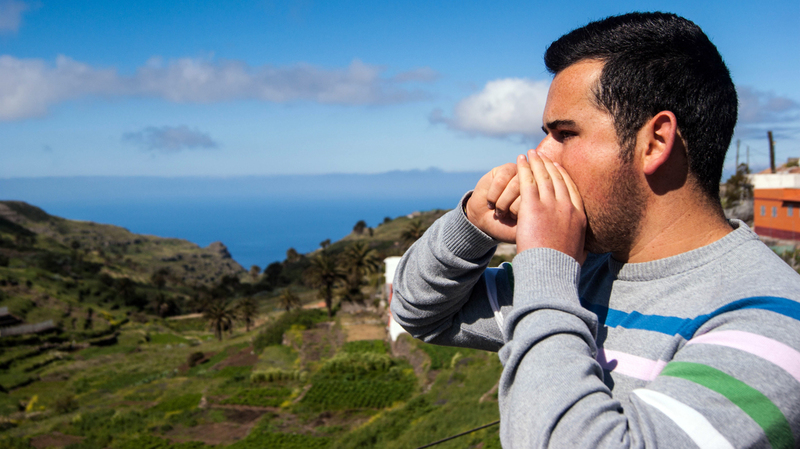 Josué is a young guarapero (person who extracts the juice of the palm tree) living in the municipality of Vallehermoso in La Gomera who, while recording, tells us his experience around the famous guarapo (cane juice) extraction, with which they prepare the palm honey. One of those elements closely linked to the daily life of the Gomerans for centuries. You can hear the sound of his work while scraping the heart of the palm, whose visual appearance can be seen in the image. The background sound of bees, attracted by the sweetness of this precious liquid, a very typical scene and full of great ethnographic values on the island of La Gomera.